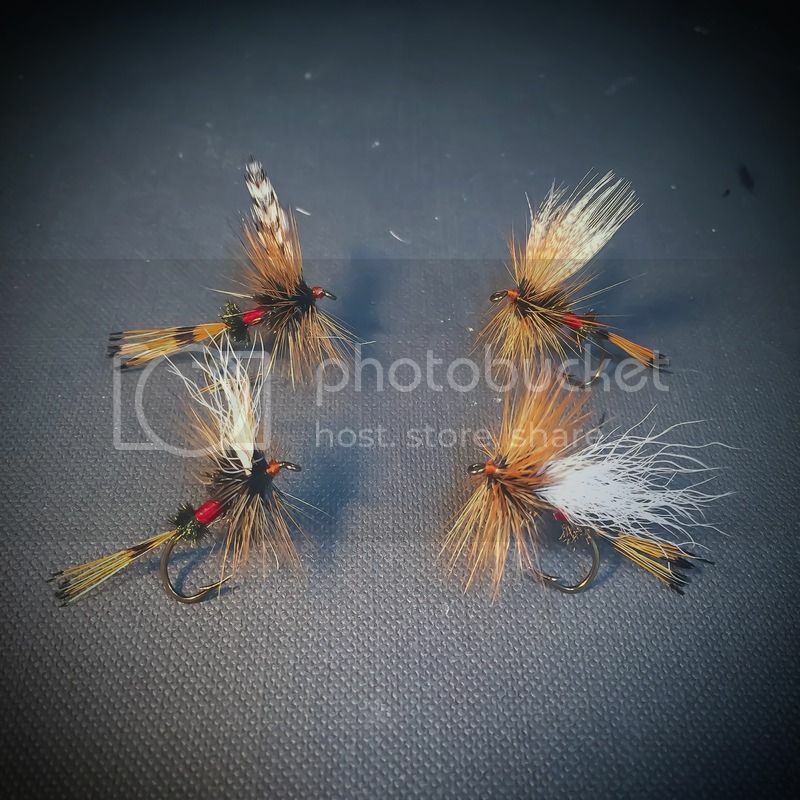 Go easy on me...I've tied about 4 dry flies in my life prior to these. I recently picked up a furnace saddle (for flat wing streamers) and figured what the heck. Pretty enough dries. They'd fool trout. Size? Keep your eyes peeled for a natural coachman brown cape or saddle. Furnace looks good on these, but the black center of furnace and badger is not common for dries. Like tinsel bodies on Bergman wets. Thanks Dale and Geert...these are rather large at size 8, but i'm going to probably fish them on some lakes/ponds around here for whatever might bite them. I'm working my way down to some smaller stuff, but I got that furnace saddle mostly for the flatwings, but also to tie some large dries to mimic some reddish/orange dragonflies that the bass around here can't lay off of once the heat of summer kicks in. Probably tie it much like an ausable bomber. The dragon flies have an almost brownish/black core to them, hence the furnace hackle. I have a coachman cape, but its a little on the webby side, that i've really only used the largest feathers for on streamers. I'll pick through it and see if there is anything of use. Seems like a good idea to cast a few dries. Those are large. Beware too light tippet that will twist when the fly helicopters on casts. One of my favorite carp flies was a small Royal coschmsn trude. They'd sip it in. And bluegill got more than curious, too. The venerable coachman and its variations continue to fool poor slimy finned denizens of the deep. I love it Matt. We tie them big here for salmon and seatrout. And I mean big. They look like hummingbirds when you throw them out. I actually like the furnace on smaller trout versions and a nice brown almost ginger on the big salmon ones. Great work.